Automation of many graphical constructions, including simple ones like channels, trends (higher highs / lower lows) or Fibo grids, requires defining a "refined movement", i.e. price passing from local minimum to local maximum and from local maximum to local minimum. ZigZag indicator is most efficient in searching for such movements, as well as in looking for local Highs and Lows. I have already proposed a simple algorithm for searching local Highs and Lows implemented in Simple ZigZag. The main difference of Simple ZigZag from the conventional one is the much more simple and fast algorithm, as well as the single parameter - typical correction depth. 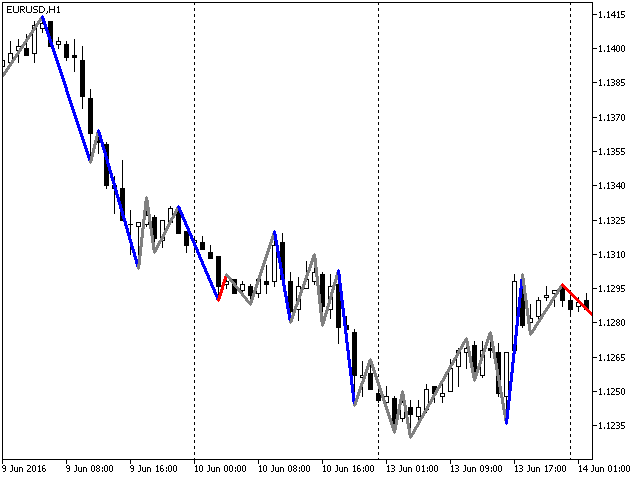 ZZ Color Retracement indicator is the development of the idea of automating analytical ZigZag-based constructions. In particular, the indicator detects significant impulse movement and colors them in blue. Short corrective movements are shown in red, while medium flat areas are painted in neutral gray. Typical retracement size - typical correction value. 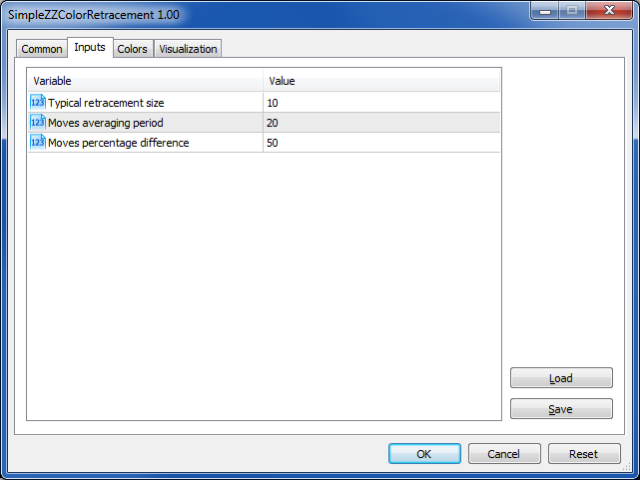 This parameter has been inherited from Simple ZigZag. Moves averaging period - number of ZigZag movements used for calculating the "average movement". Percentage difference - threshold ratio of the last ZigZag movement to the moving average pass. If the ratio exceeds 1 + parameter, the movement is considered to be impulse; if it is lower than 1 - parameter, the movement is considered to be corrective; if it is in the middle ([1 - parameter, 1 + parameter]), the movement is flat. Now, that we have made ZigZag to detect impulse passes, our next step is to apply the Fibo grid. Fixed indicator drawing in the strategy tester.